Over 3 months of stuff? Community – I’d watched Advanced Dungeons and Dragons last year and always meant to watch more. Took advantage of long plane flights to watch the first season and wow, how have I not gotten into this show before now? Best. TV show. Ever. My favorites are Abed and Troy. I’m more than halfway through season 2 and have already caught up on the new season; and I know this is just echoing what everyone else has been saying, but Remedial Chaos Theory was amazing. 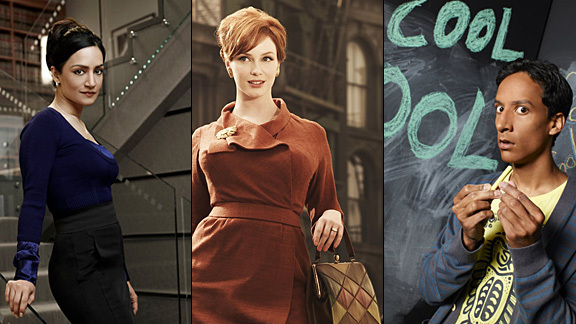 Mad Men – I’d been watching the 4th season as it aired earlier this year, and about 2 months went back to the first season. Love it. I love how seeds planted in an episode bear fruit 10 episodes later. I love the characterization, and I particularly love the female characters, and how each navigates the male-dominated world they live in in their own way… some better than others, obviously. The Good Wife – Watched the second half of last season and then went and watched what I’d missed in the summer hiatus. I’ve already caught up on new episodes. Kalinda and Eli are one fabulous team, and I’m really enjoying seeing Lisa Edelstein play a character so different from Cuddy. The Hour – Was also about halfway through when I went on vacation. It’s not Mad Men, but I like it a lot. Loved the episode where everyone was invited to Hector’s in-laws’ country estate. Love Freddie Lyon. I’m kind of really really behind on OOO (read that as in: I have no idea about Date’s general state of well-being, in general), but the song is cool! Also, top hats! Okay, seriously why is it that my favorite characters always seem to die or suffer horrible fates? I mean, well, okay, not always, not every one of them, but very very often. As far as I’m concerned, the important thing about these episodes is… Date backstory!! I mean, yes, there was all the stuff about Date’s former colleague, and how she wanted to be pretty like her sister, and how the lesson is that about real beauty and being yourself, yada yada yada… I think it’s fair to say that I have a lot more to say when the underlying theme is about how justice is subjective or the like than this, because… well, there’s not much to say, right? Anyway, apparently Date was in some kind of Doctors Without Borders, and he was called The Fighting Doctor (so, not exactly Doctors Without Borders, probably). So, yes, I got it wrong, did not expect this, and I found it pretty interesting actually, that he used to dedicate his life to helping others while now his motives appear to be more selfish. Of course, by now the real reason he wants that money has probably been revealed, but at this point it hasn’t, so there you go. Also interesting is how at the end Gotou asks him if it’s okay to just let go of his former colleague like that, since she appeared to be into him, and he says rather matter of factly that has his hands full right now. Right. Been busy again, yada yada. 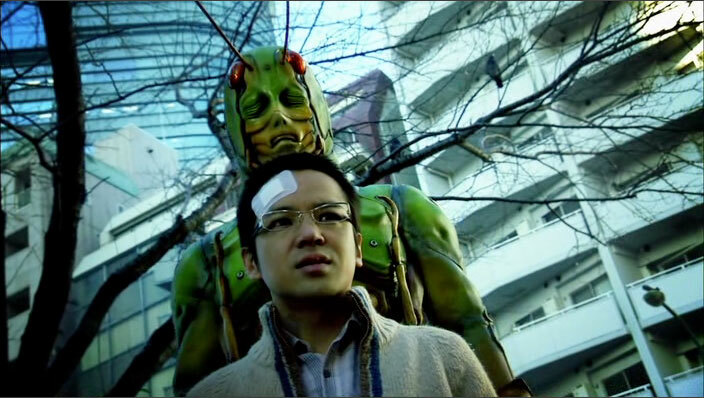 But it doesn’t feel right to just skip through, so I’ll go off my notes for the episodes I watched (yes, I take notes while watching Kamen Rider, and yes, I realize what this says about me) but didn’t get around to blogging about. Episodes 21-22 explore whether the desire to fight for justice can become twisted. The Yummy is born from a man who never passed the exam to become a lawyer, and was frustrated because he felt like a failure, and so he left his family. The Yummy initially targets criminals, and so the man accepts the Yummy as a way to punish those he perceives as wicked. From there, the show obviously moves to questioning whether this is really justice, and how self-righteousness twists a person’s sense of justice so they become cruel themselves.